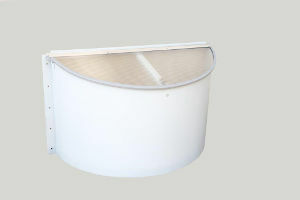 Our window well and cover combo unit, shown here with the window well cover open. For over 50 years, Steelway Cellar Doors has been creating solutions for both traditional and non-traditional basement openings. We are proud to introduce our state-of-the-art basement window well and window well cover combo unit, an all-in-one solution for your basement window needs! If you're interested in learning more about this top-notch window well and cover combo unit, exclusively from Steelway Cellar Doors, don't hesitate to give us a call! We provide free cost estimates in King of Prussia, Norristown, and throughout the Greater Delaware Valley. Steelway Cellar Doors' window well and cover combo unit will provide complete protection and function for your basement egress. By combining your window well and window well cover into one complete unit, you can enjoy a seamless appearance with low-maintenance opening hinges, superior insulation and ventilation, and excellent weatherproofing thanks to our twelve gauge galvannealed steel. When you're looking for high-quality craftsmanship and long-term durability combined with a stylish aesthetic, our window well and cover combination units can deliver exactly what you need! Another view of our window well and cover combo unit, shown here with the cover closed. Whether you're looking for a replacement window well and window well cover for your current basement egress windows or are looking to install a brand new window well and cover, Steelway Cellar Doors can help! Our window well and cover combo units are the perfect solution for your cellar windows, guaranteed to provide lasting waterproofing and an easy to operate basement egress. Contact us today to find out more and receive a free quote in Norristown, King of Prussia, Wayne, or nearby.